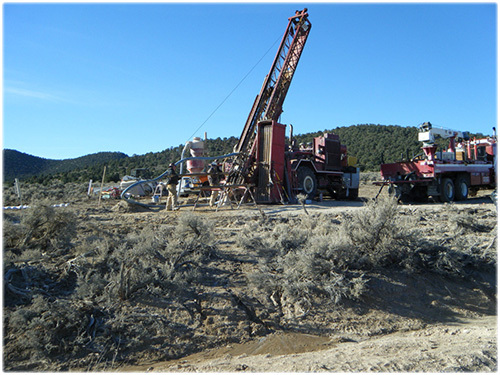 Las Vegas, NV - Patriot Gold Corp. (PGOL) or ("Patriot Gold"), a gold and silver exploration and production company, today provided additional results from its ongoing core drilling program at the Penelas East zone at the Bruner gold project located in Nye County, Nevada. Core drill hole B-1446C intersected 22.9 meters (75 feet) grading 3.29 g/tonne Au (0.096 oz/ton Au) from a depth of 221.6-244.5 meters (727-802 feet). Several other zones were intersected higher in the hole, with intercepts at the far northern end of drilling at the Penelas East discovery area. Drilling results continue to indicate that the Penelas East discovery area remains wide open for further expansion and exploration to the north. Results for second core hole, B-1454C, which intersected the high-grade target area 23-30 meters (75-100 feet) north of the high-grade intercept in holes B-1446C and B-1436 is expected to be available in November. "The results we have seen thus far from our ongoing drilling program continue to indicate that there are further expansion opportunities surrounding the Penelas East discovery area which means a strong potential towards uncovering additional mineral resources," said Bob Coale, CEO of Patriot Gold. "This is an exciting time for the Bruner project as we complete the final stages of drilling for the remainder of 2014 and conduct the thorough analysis needed before taking the next critical steps towards capturing the potential long term value of this project." Drilled at the open northern extension of the Penelas East zone, core drill hole B-1446C intersected 22.9 meters (75 feet) grading 3.29 g/tonne Au (0.096 oz/ton Au) from a depth of 221.6-244.5 meters (727-802 feet). This zone incorporates a 5 foot (1.52 meters) wide, high-grade interval at 237.8-239.3 meters (780-785 feet) grading 37.5 g/tonne (1.094 opt) Au. In addition, several other zones were intersected higher in the hole as referenced in the table below. These intercepts are at the far northern end of drilling at the Penelas East discovery area with the nearest neighbor drill hole to the north over 100 meters away indicating that the Penelas East discovery area remains wide open to the north for further expansion. Core hole B-1446C intersected the deeper mineralized zone containing the high grade zone 32-35 feet (roughly 10 meters) along strike from the high-grade intercept encountered in RC hole B-1436. The high grade zone intersected in hole B-1446C remains open to the west and north, as does the thick lower grade mineralization encountered higher in the hole. A second core hole, B-1454C, was drilled into the high-grade target area and intersected the high-grade target area 23-30 meters (75-100 feet) north of the high-grade intercept in holes B-1446C and B-1436. Results from core hole B-1454C is expected to be available in early November.